Wishing you a whole new month of sunny days in the garden! The magical month of May really flew by quickly! Although I spent many happy hours in the garden, rainy days kept me inside much more than usual the past few weeks. There were so many days when I could only enjoy the garden through the windows, as the raindrops trickled down the glass panes. Luckily, I knew where to find a ‘sunny’ spot, even on the rainiest of days. With a cup of tea in hand, I happily disappeared into the ‘Paper Garden’ ~ my little papercrafting studio downstairs. The bright ‘sunshine’ of daylight bulbs and colorful, dried flowers and herbs (from last year’s garden) hanging from the ceiling rafters, inspired creative ideas to bloom. Creating cheery cards and playing with watercolors are two of my favorite ways to create my own sunshine in spite of the weather outside. Between downpours, my camera lens captured some favorite ‘moments in time’ in the garden last week. The final week of May was a very colorful one in our Midwest cottage garden. What fun to fill vases with flowers to bring some of the garden inside! 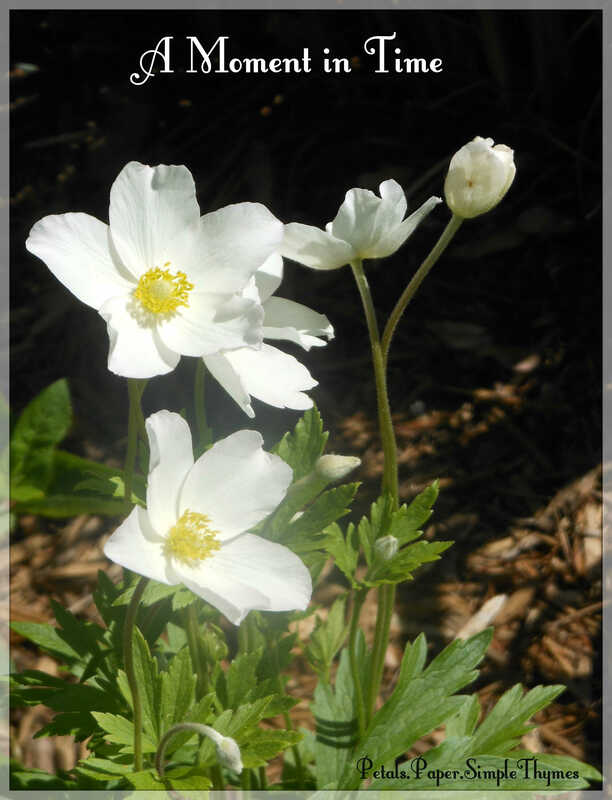 Anemones were breathtaking in the early evening sunlight. I filled small vases with dainty bouquets of Anemones and Dianthus. 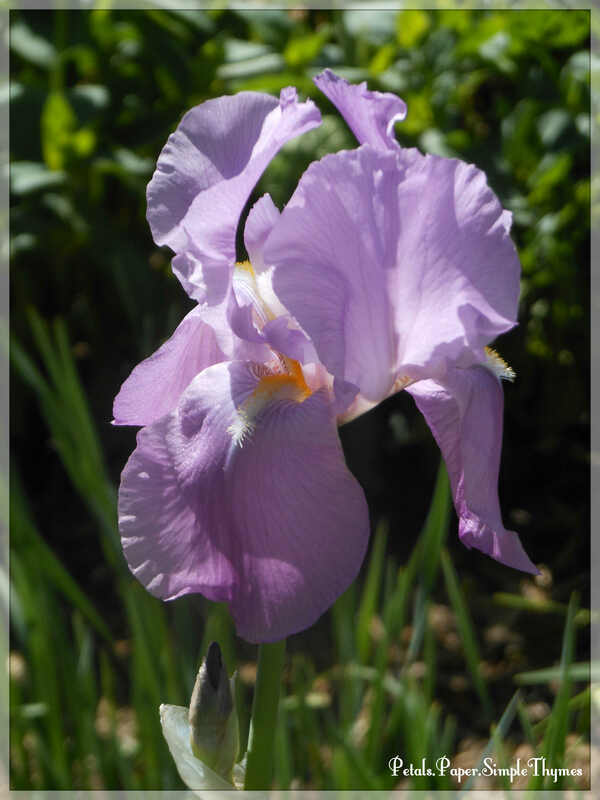 Irises were the first flowers to bloom in my Friendship Garden. They always remind me of a very special friend! The delicate blossoms of Cranesbill Geranium, Lilies of the Valley, Anemones, Daisies, Allium, and Spirea added soft color to the garden in late May. This Rhododendron holds fond family memories. Originally a gift from a neighbor, it grew in my mom’s garden while I was young. 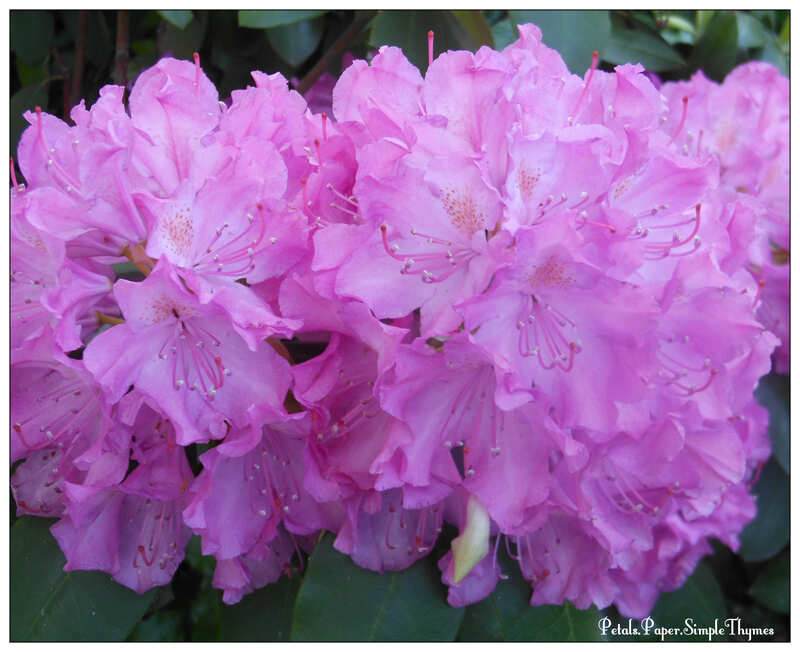 Before my parents moved across the country, they dug up the Rhododendron and brought it to me. 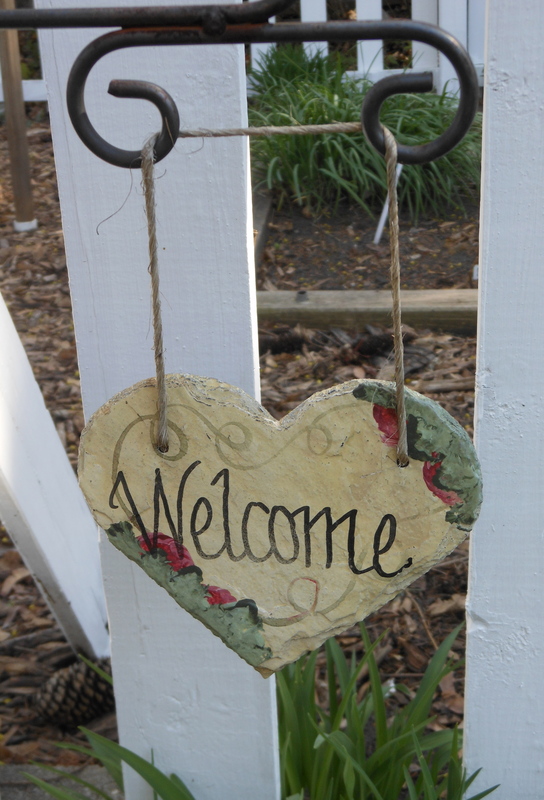 I just love the sweet family memories it adds to my garden today! 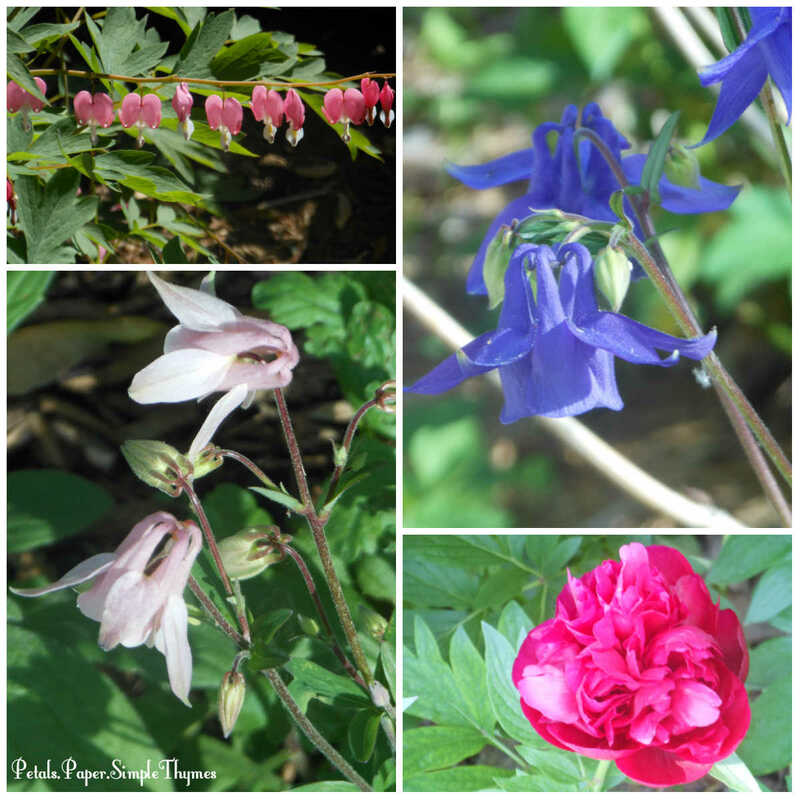 Delicate Bleeding Hearts, blue and pink Columbine, and bright Peonies added pops of color to our old-fashioned cottage garden in late May. This Peony plant was already growing in the garden when I moved here 28 years ago. Caring for plants that are a part of our home’s long history is really an honor! 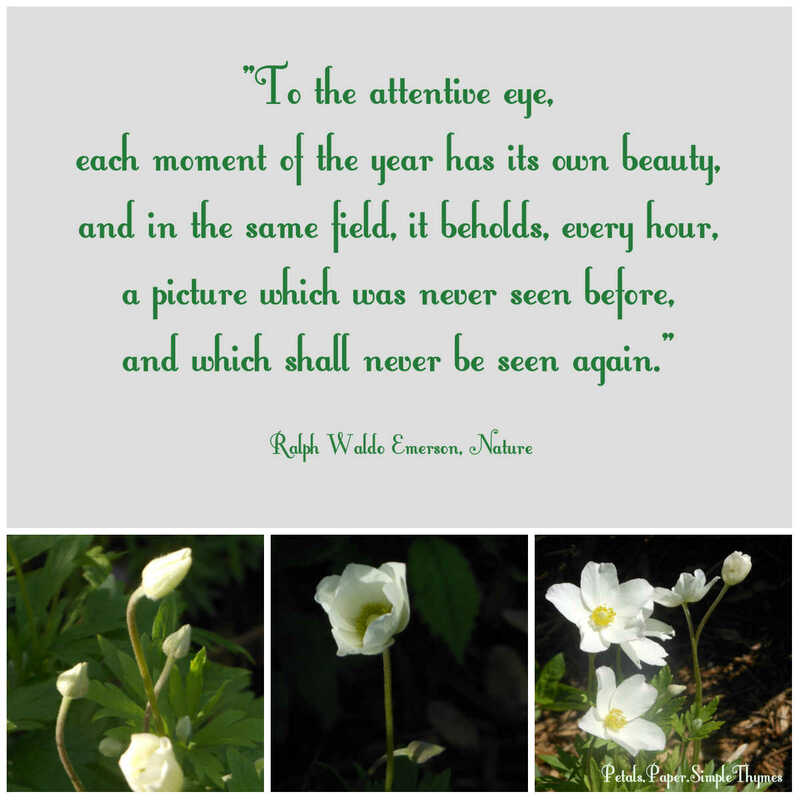 As meteorological summer begins, the first week of June predicts delightful days in the garden! A full week of sunshine is expected, as our temperatures gradually warm up. There is so much gardenkeeping to do everywhere I look. As always, there are challenges in the garden. Creeping Charlie (ground ivy) is invading our lawn and making its way over the mulch and into the flower beds. A friend, who often sees me pulling out these bothersome vines, says that we have ‘Galloping Charlie.’ I agree! Our other big challenge in the neighborhood is an abundance of hungry groundhogs (woodchucks) who think of our garden as a salad bar. It must be groundhog GPS that leads them right to the newly planted perennials and alerts them to tender, tasty blossoms to nibble. If only we could train the groundhogs to develop a taste for Creeping Charlie! It would be a gardener’s dream-come-true! What challenges are you facing in your garden as spring turns to summer? and shall never be seen again! Wishing you a day filled with joyful moments! 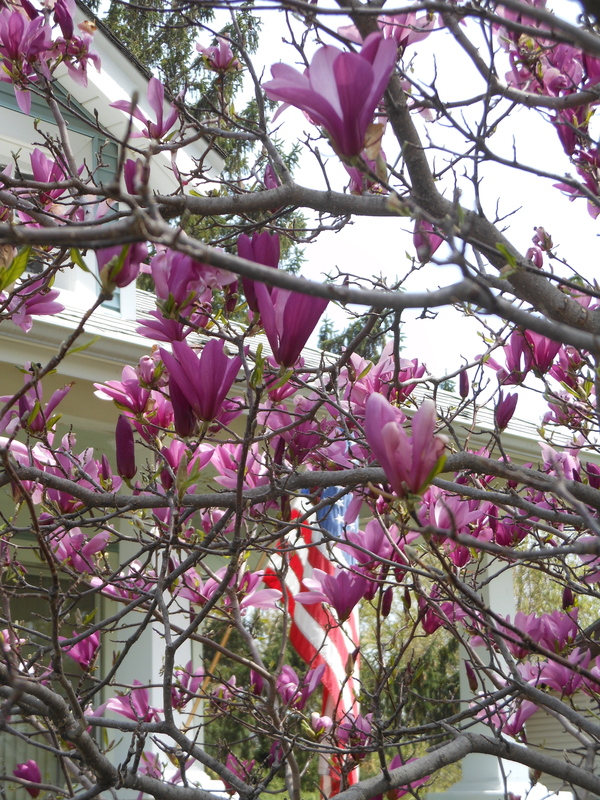 It’s warm enough to relax on the front porch swing and enjoy the Magnolia blossoms! 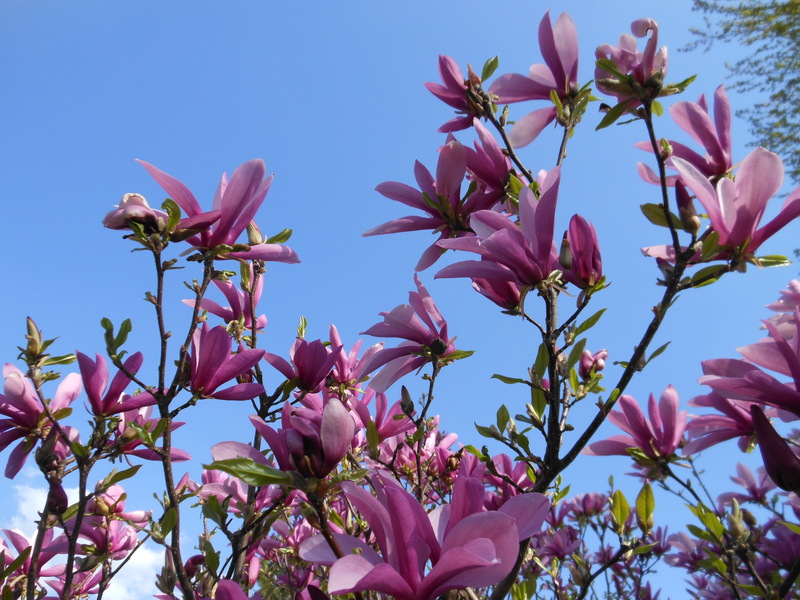 Although the Magnolia blossoms only last a week or so, we truly enjoy them! Whenever we step out the front door, we are greeted with a lovely, pink bouquet! 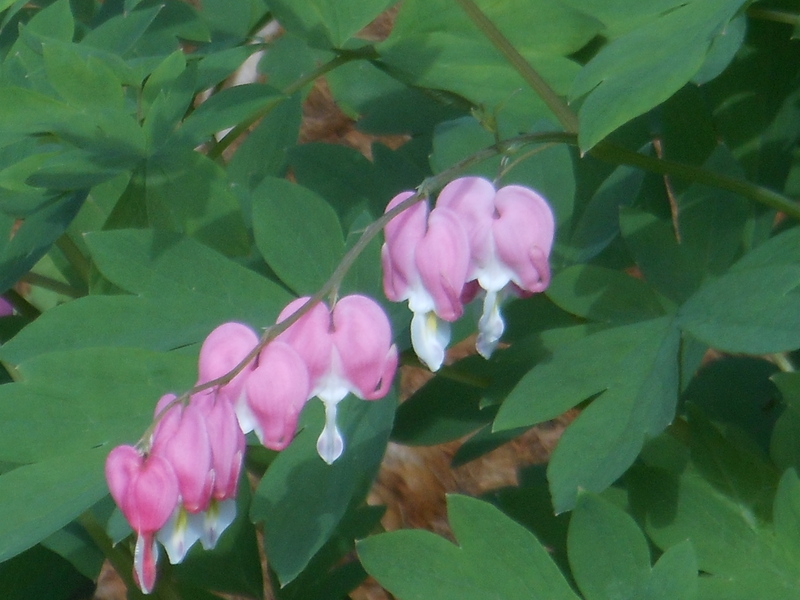 In the shade of our huge pine trees, the Bleeding Hearts are in bloom. 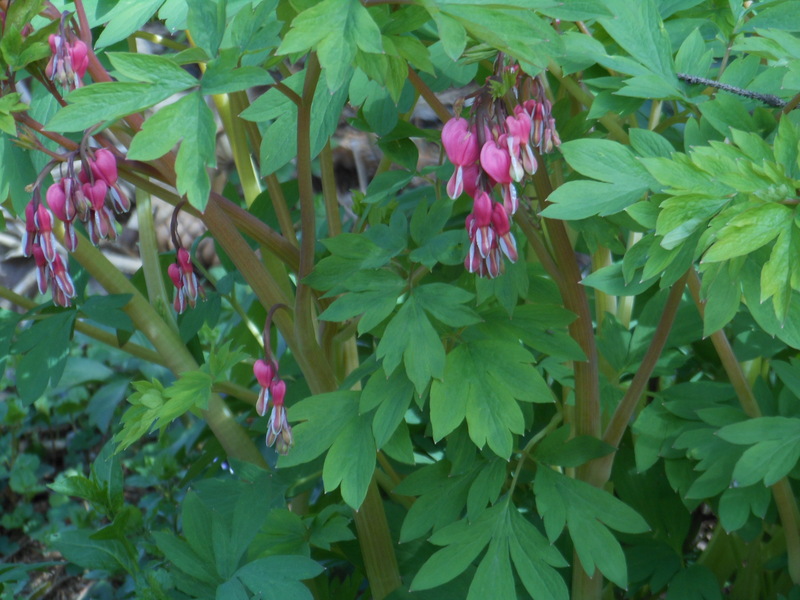 Bleeding Hearts have such delicate, charming, old-fashioned blossoms. 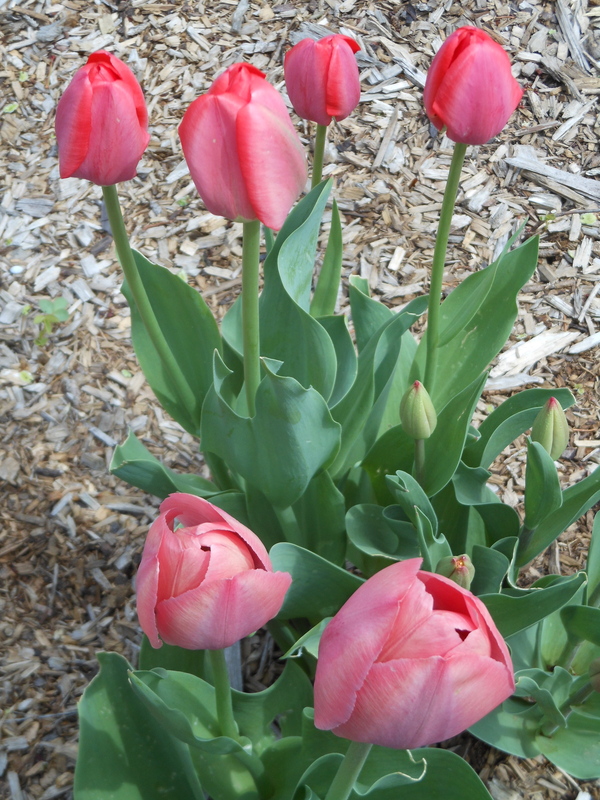 Tulips in pastel shades are bobbing in the gentle breeze. 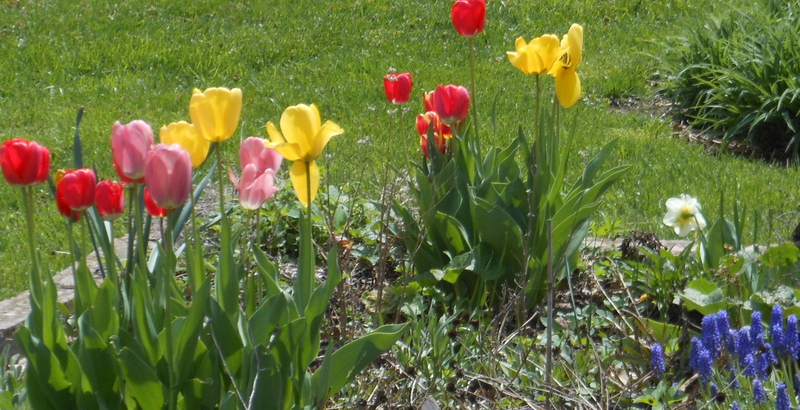 These tulips in mixed colors are as bright as crayons! Yellow Forsythia branches spill over the herb garden fence. 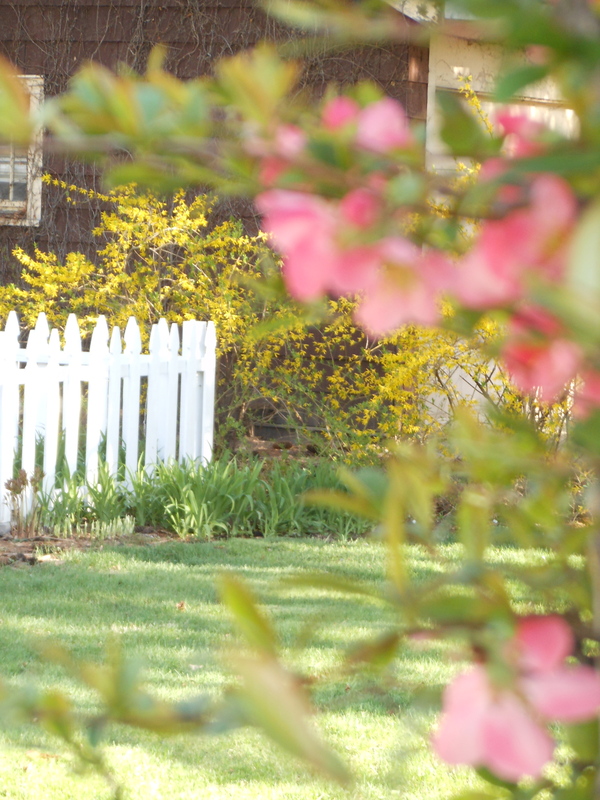 Bright pink Quince blossoms greet backdoor guests. One of the special joys of gardening is sharing our garden with friends. 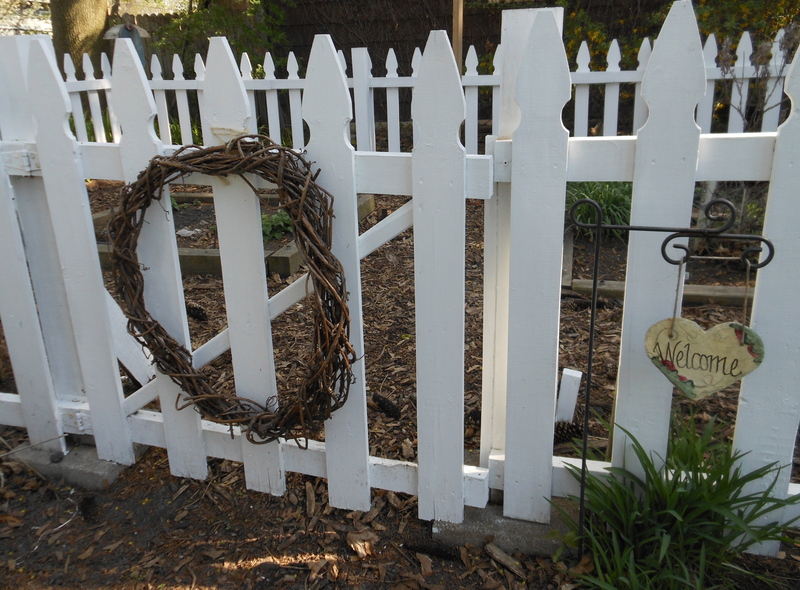 In a few weeks, we will walk through the garden gate together to visit our herb garden. The fragrant herbs are sure to delight all of your senses! I’ve been spending my afternoons ‘gardenkeeping’ this week. There is always a LOT of Spring clean-up in our garden. When the growing season ends in the Fall, I always leave the stems and dried flowers on all of my perennials. It creates such a lovely ‘shadow garden’ all winter long. Whenever we are walking through the snowy yard or shoveling the snow, we can still enjoy the garden and the memories warm summer days. The birds enjoy the flower seeds, too! In the very early Spring, the dried flower stems provide lots of nest building materials. My hours spent happily gardenkeeping are filled with birdsong and Spring breezes. It’s such fun to watch the garden change each day, as new plants emerge and grow quickly. Now it’s time to add new mulch to the flower beds and prepare the containers for their new plants. I’m always so excited for our Spring planting day to arrive on May 15th. For me, it’s the very best day of the year! It’s a time filled with the wonders of Spring and the promise of Summer! 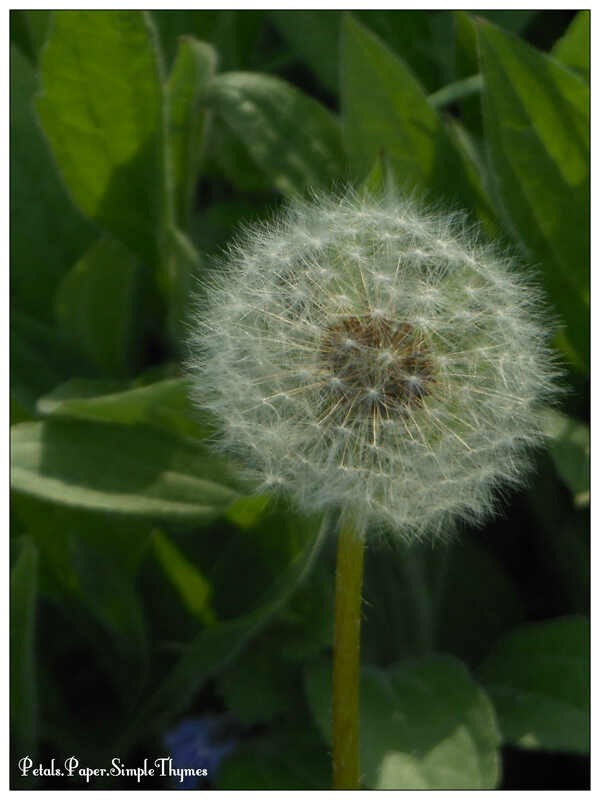 A visit to Susan Branch’s wonderful blog will fill you with the wonder of Spring! 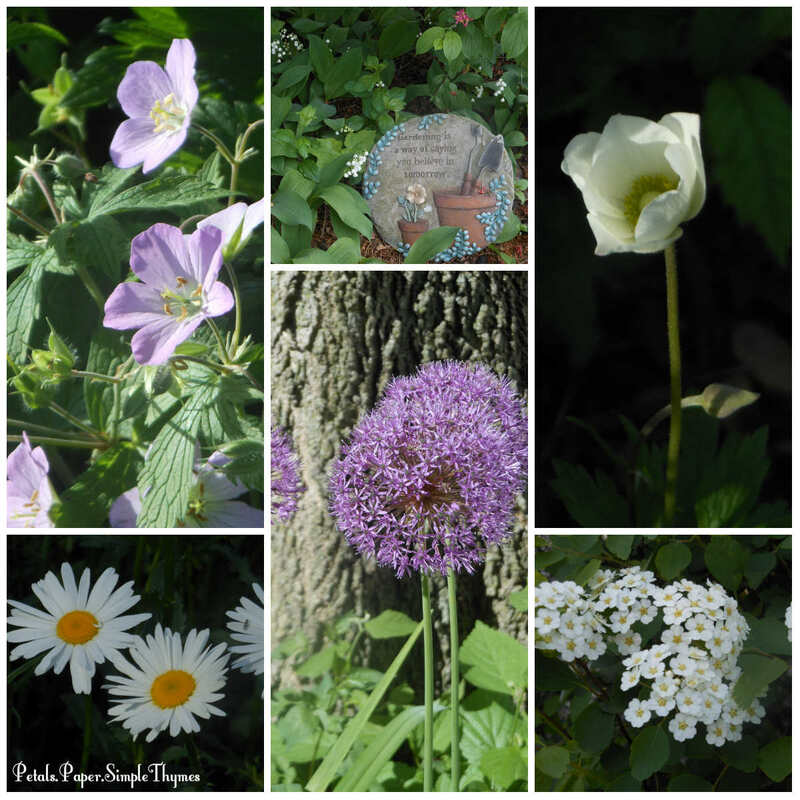 Stop and visit her beautiful gardens on Martha’s Vineyard! P.S. What’s blooming in your garden this week?